Connecticut Residents Grind Their Teeth Too! A recent article in the Washington Post discussed teeth grinding and gave numbers suggesting that nearly half of the adult population in the Washington DC area either grind or clench their teeth. The reporter apparently has never visited the stressed out state of Connecticut! Our experience in Orange treating thousands of patients has shown us that many Connecticut residents grind or clench too. 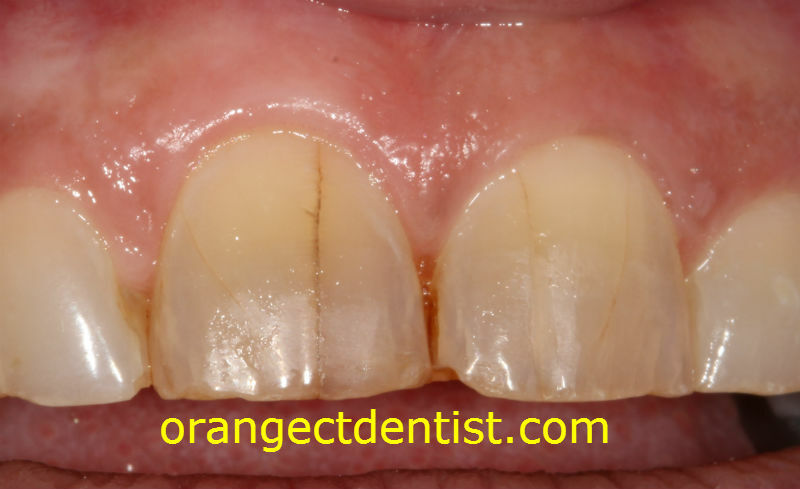 Craze lines or cracks on front teeth on one of our patients. This was from years of clenching at night. The above photo is from a long time female patient in our office. She freely admits she is stressed – commuting into Manhattan a couple of days a week – as well as travelling across the U.S. for work. She has been grinding her teeth for many years. Even though we had recommended a nightguard, she did not follow our recommendation until she developed these cracks on her front teeth! Bruxism is defined as the involuntary grinding of your teeth, occurring most frequently while sleeping. According to the American Academy of Sleep Medicine, bruxism frequently occurs in highly determined people. And the research clearly shows that teeth grinding in adults is caused by and exacerbated by stress. A cracked tooth from years of nocturnal bruxism on our patient from Woodbridge. This tooth required a crown. Visble wear on both the front and back teeth. Cracks so deep that the teeth require crowns and/or root canals. 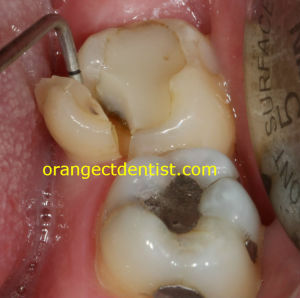 The photo to the right shows a crack that caused a tooth to need a crown. Fractures leading to loss of one or more teeth so that dental implants are required. Pain and/or dysfunction of the jaw muscles and temporomandibular joint (TMJ). These are collectively known as TMD (temporomandibular joint disorders). 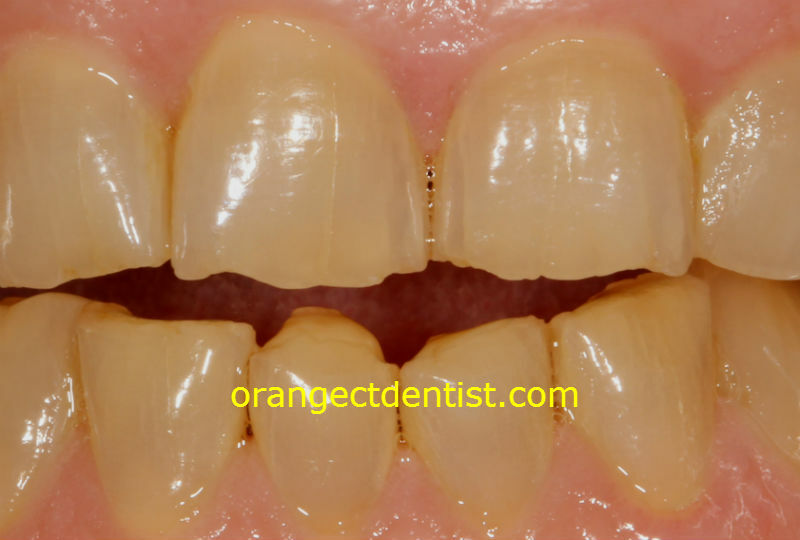 In our office in Orange, we’ve seen it all – including all 5 findings in one patient! Another Connecticut resident who grinds his teeth! Before we can even begin treatment, we need to establish that the clenching or grinding is still occurring. Many times patients will grind or clench their teeth for a period of time and then stop. But in most cases, the activity continues, especially for stressed out Connecticut residents. 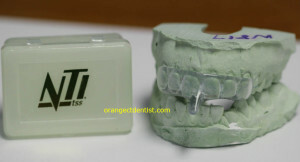 NIT bruxism appliance for one of our patients. The most common treatment option is a nightguard. As the name implies, a nightguard is custom fit protection for your teeth. The nightguard to the left is one of many types we make. This is called an NTI. One of the key mishaps that can occur is a “one size fits all” approach. There are many types of nightguards available, each for specific purposes. We spend a great deal of time analyzing our patient’s problems so that we make the correct type of appliance. Making the wrong type of nightguard can actually make things worse! Once the appropriate appliance is made and used by the patient, the TMD symptoms will typically resolve, and the teeth are far less likely to break or fracture. So, it doesn’t matter if you live in Connecticut or Washington DC. If you’re grinding or clenching, you need a nightguard. We are always available to discuss your symptoms and recommend the most appropriate solution.